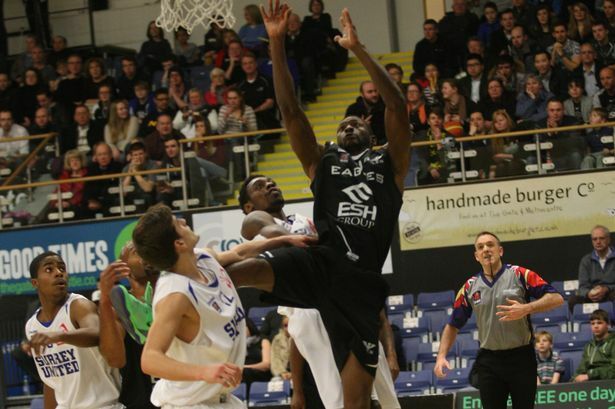 Newcastle Eagles bounced back from their BBL Championship defeat to Cheshire by crushing bottom-of-the-league Surrey United at Sport Central last night. Surrey sinking two quick three-pointers in the opening two minutes to lead 8-4 was as close as they would get to taking anything positive from the game. From the four-point early deficit Newcastle then raced to a 17-8 lead, courtesy of a 13-0 run – punctuated by a Malik Cooke breakaway dunk plus the foul. The visitors did try to make a game of it by scoring 12 of their first quarter 15 from distance, but they were being out-rebounded by a ratio of 3:1. Newcastle led 30-15 after 10 minutes and continued to pile on the points in the next quarter. A succession of defensive rebounds and steals led to fast break after fast break, and there was simply nothing Surrey could do. The Eagles were not at their fluent best, but they did not have to be, as tough defence in the paint forced the young southern outfit into taking more challenging shots. By the end of the first half United had shot 58% (7/12) from the land of three which was admirable, but they could not cope with the Eagles’ interior pressure. Newcastle ended the half leading 56-36, out-rebounding United 26 to 11 and doubling their assists 16-8. The second half began where the first left off for both sides – Surrey continued to struggle to take good percentage shots, while Newcastle reaped the rewards on both ends of the court. Newcastle’s lead grew through the third period, but it was not the vintage basketball North East fans were used to seeing, as both sides were well into the double-figure stakes for turnovers. The difference was that, by the end of the penultimate quarter the Eagles had produced 27 points from Surrey’s slip-ups, while the away team had only managed four from Newcastle’s errors. Period three started and ended without much ceremony and the Eagles led going into the final quarter 84-59. Valuable BBL minutes for 17-year-old Eddie Matthew was a testament to how much cruise-control was on during the final quarter of the game, and the rising star repaid head coach Fab Flournoy by notching his name on the scoresheet. The facts did not make good reading for Surrey fans – they trailed in every statistic other than three-point and free-throw percentage. But the telling sign for United was their ball retention – they turned the ball over nearly double the amount of times that the Eagles did (15/29) and it was punished on nearly every occasion. At BBL level, against one of the top sides in the league, that only leads to defeats. There were encouraging signs, coming in the form of their three-point shooting, but that is a dangerous ploy to rely on in this league. Newcastle cruised home in the fourth quarter to record a 104-73 victory, keeping a grip on the top teams in the lead. Cooke was the standout performer with a hugely impressive 34 points to lead all scorers, 14 rebounds, seven steals and four assists.